On Section 1, between MPs 67.30 and 71.50, Monongahela National Forest contract logging can be expected at some time during January-March 2019 and/or December 2019-March 2020. In this segment, the ALT follows Preston Co. Rt. 112/1 and Tucker Co. Rt. 7. Two types of logging will be used, the conventional method uses on-the- ground log-moving equipment and the helicopter method uses (guess what?) to move logs. Conventional logging will not require trail closure, although hikers should be aware that logging trucks may be running the roadways/ALT. Cheat/Potomac Ranger District personnel are planning to post signs that alert hikers to logging in the area. Helicopter logging will result in temporary area closures for visitor safety. Due to unpredictable weather and work-day availability, District personnel do not yet know when these closures will occur. There will likely be only a couple of days’ advance notice. 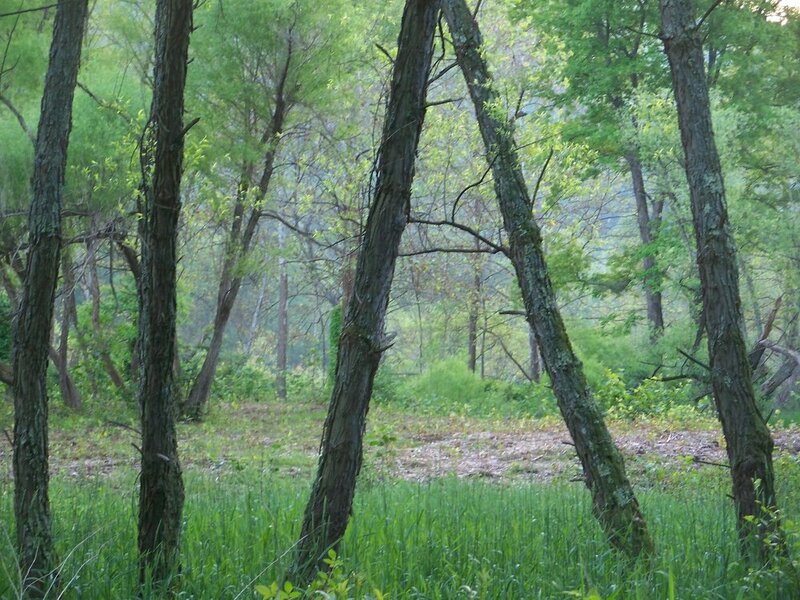 The timber sale administrator will advise Alex Schlueter (MNF North Zone Recreation Staff Officer), who will notify WVSTA when closure is expected. We will try to get the closure notice on the WVSTA website asap after we have been notified. Warmer season hikes should not be affected, and MNF staff explained that the parts of the roadways that are currently in terrible condition, even for hiking, will be in better shape after the sale is completed. Section 1 Trail Coordinator: Greg Edwards - 724-428-4456 To report any trail condition problems you may have encountered in this section please e-mail the Trail Coordinator. The old, wooden-planked bridge over the rail yard near Rowlesburg has been replaced by a new concrete structure. Blazes are once again visible at both ends of the new bridge. About a half mile before you get to the bridge is a gated road to your right as you come down off Briery Mountain. This road is private property, but the Rowlesburg Area Historical Society invites ALT hikers to walk around the gate to access the lip of Cannon Hill where you can see the Federal gun emplacements that were intended to protect the railroad and bridges from the Confederate army. 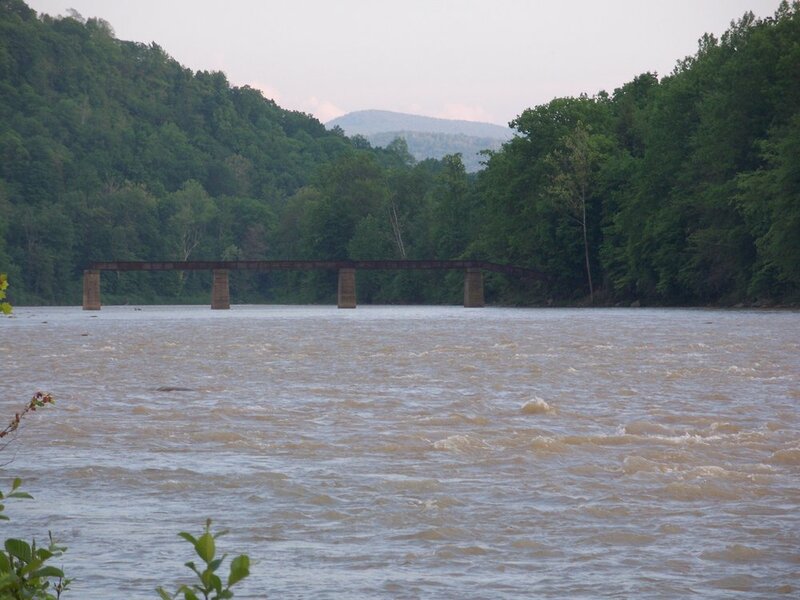 As an example of how the WVSTA and local communities work together, the town of Rowlesburg has offered the large flat area on your left as you approach the new Charles B. Felton Bridge as an authorized camping area. WVSTA volunteers constructed a spacious Adirondack-type shelter overlooking the railyard in 2006. The area is patrolled by volunteers from the town of Rowlesburg. The town of Rowlesburg has a new restaurant--the Rope's End--around the corner from Bell's Market. And there is a new World War II museum with mannequins costumed in military dress from that war. Other sights in Rowlesburg include the Railroad Museum in the original depot and the V.M.D. Black Box that makes model airplane parts. As you travel up Lantz Ridge Road, the old Wotring Chapel, which burned a few years ago, is no longer visible. It stood across from the small cemetery at a sharp switchback in the road. An Eagle Scout project in 1998 and the cooperation of a private landowner along Lantz Ridge provided a shelter near the Wotring Chapel site. White blazes direct you to the shelter, which is on the other side of the small pond you can see in the field across from the cemetery. Follow the woods road away from the trail, turn left onto another woods road and left again on a rough woods road near a creek. You will see the shelter on your left in about 50 yards. Watch for the right turn (southbound hikers) at Lantz Ridge Church, called by local residents Mt. Olivet. The church is never locked; you can enter and enjoy the peace and beauty of this small chapel and leave a comment and a donation. Gary Sypolt, Jr. lives in the white house on the right about 1/4 mile southbound from the church. He offers water and camping to hikers on the 600 acres of which he is caretaker. 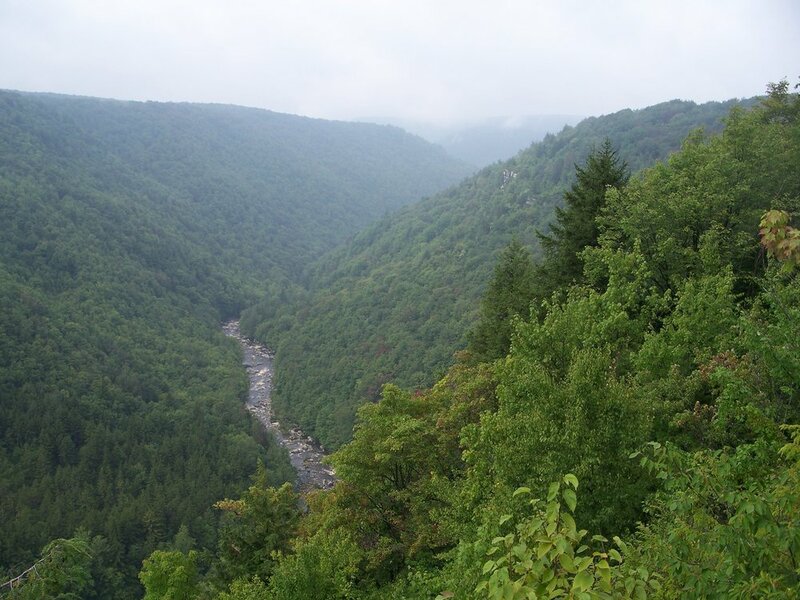 His father, Gary Sypolt, Sr. offers camping on his leased 151 acres above Beech Run. Beware of the black and white dog named Lady (Lady is no lady) at the last house on the right as you proceed downhill. She is decidedly not friendly and very aggressive. One mile north on Snake Road (rt 110) the road passes over Little Wolf Creek (small bridge). Just after this bridge on left is a gate and driveway to a small house ("Griscoms" sign at gate). Keep hiking up Snake road (you will see No Trespassing Signs - Griscom along this section), and enter the next gate on the left - this opens to log landing. Hikers can camp at landing, or hike up the southern face of the mountain to a clearing where the ridge levels off (spring near clearing to north-west). There is no direct trail to the clearing right now (hope to make one) so you can bushwack or follow logging road to left which eventually zig-zags up. Because of a reclamation project, the section of trail from Coketon into Blackwater has been rerouted onto State Route 32. Follow the yellow blazes. Watch for the turn off Route 32. We have also had reports that the blazes are hard to find coming NORTH out of Blackwater. At the stop sign in the park, the trail goes to your right along the hard-surface road, follows Route 32 North for 3 miles and turns left toward Coketon just as you enter the town of Thomas. If you get to the post office in Thomas, you have gone too far. The small ice cream parlor-restaurant in Thomas is once again open. The Purple Fiddle is owned by John Bright. Good homemade ice cream is available as well as soups, salads and sandwiches. Southbound hikers should turn left at the Route 32 intersection and follow the river into Thomas. The second building on the right is the Purple Fiddle. The duplex next door has been turned into a bed and breakfast, also owned by the Brights. If you are interested in helping to complete the Allegheny Trail, or to work on any part of it, contact the coordinator for section 1. Spring workers take a baby break. May I lay eggs now please?